When you dive into the world of collecting, it doesn’t take you long before you run across a word or two that you never heard before. Before you know it, you’ll have a broad vocabulary at your disposal. Abattant—this is a French term for a “drop lid” or a “fall front” piece of furniture. More often than not, you’ll see this on a secretary desk. Burl—this is a curly-grained wood surface (or even a veneer) that is cut from an irregular growth of a tree. This could come from a portion of the roots of the tree, and it is very common in walnut wood. Partner’s desk—this is a desk that’s large enough to seat two people facing each other. A lawyer’s office could have used one of these, and this desk has working drawers on both sides. There are plenty of words like these, which ones have you run across? May flowers bring great deals! The old saying “April showers bring May flowers” is very true. But why not bring some of those flowers inside—with the kind that don’t need any watering. Floral prints can be seen on a wide variety of items. It could be a pottery vase, a serving piece, a piece of jewelry, or even a piece of glassware. What’s better are the floral prints that even come on fabric. A great piece of pottery with this is this piece of Hull pottery vase with the ROSELLA pattern. 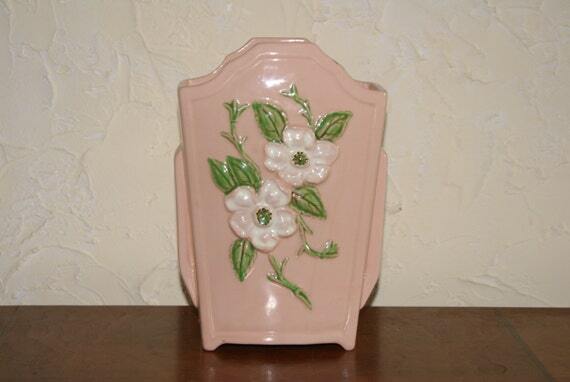 The vase was made in the 1940’s, and can be seen in my Etsy shop here. 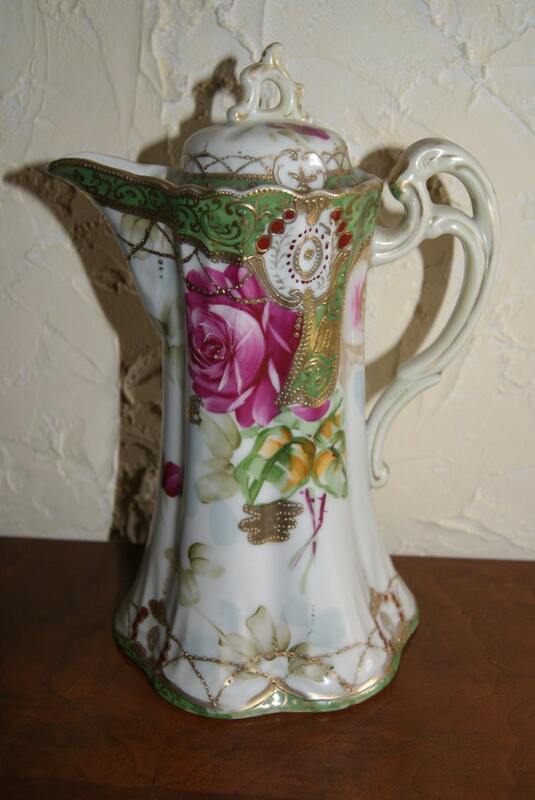 Another great item with a floral motif is this china hand painted Made In Japan chocolate pot. The 1920’s serving piece can be seen in my Etsy shop here. Jewelry is another area that has pieces with a floral motif. 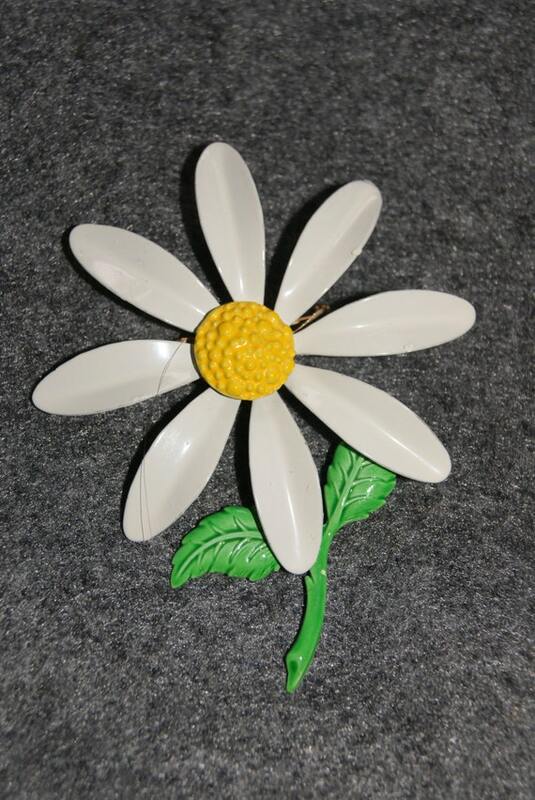 Like many other areas, there’s a ton of choices that have a floral motif, and one of the choices is this pin. The great thing that this white enamel pin has going for it is that it can go with just about any outfit, weather it’s casual or dressy. You can see the pin in my Etsy shop here. There are plenty of items with floral motifs on them. What have you run across? Welcome to my new website for Wisdom Lane Antiques! I have recently moved here from my old blog, which can be seen here. I will still talk about all of the great things that I have for sale, plus I will also talk about the history of an item. My old blog will still be active so that you can see all of the great posts that I have there. I hope that you enjoy my new site!